All Music All The Time! For those who just want to play music, this is the place to feast on workshops all day long, and music sessions moderated by staff bands during the evening dances. Whether you learn by ear or notation, bring your instruments and voice to participate in focused music workshops in both daily classes and special one-time sessions. Or join a like-minded pick-up group and jam! It’s wall-to-wall music sessions and workshops throughout the day and evening. You don’t have to be a dancer or a musician to enjoy the full music track at AmWeek. Mix and Match with Uncle Farmer: Ask questions and get answers on how to match tunes to the dances and how to match tune to tune for two- or three-tune sets. Fiddling Around with Ryan McKasson: Practice Improvisation and playing around with the tune with a Scottish fiddling champion. An open mind and your fiddle are the only requirements. Contra Piano with Jeff Spero: Learn the techniques that work the best to keep the band and dancers happy alike. Fiddle Lessons with Shira Kammen: Work on what you want with Shira’s wise and wacky guidance. Sign up for 20-minute sessions. Singing with Christa Burch: Lift your voices together! 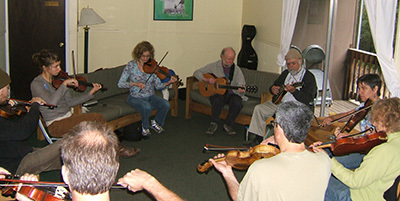 We’ll learn songs from the Irish, Scottish, and American folk traditions. Courting, finding love, experiencing loss, being far from dear places and people—they’re universal experiences. Write That Tune with Ashley Broder: A low-stress, high-camaraderie environment and Ashley’s guidance will help you enter the joyful world of tune writing. Jam with any instrument! with Jim Oakden: Learn & play tunes at a stately tempo, beginning music theory & chording, ear training, small group instrumental instruction...whatever people want. All newcomers and seasoned musicians are welcome. Bring any instrument, and let’s have fun. 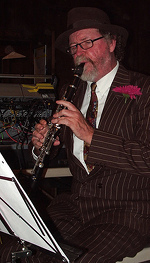 Camper Band led by Jim Oakden & Shira Kammen: Join in playing tune sets at dance tempo to be performed at the Wed. Camper Night. If you want, become the Band Leader of the Moment, where folks take turns leading the band. Much fun with no worries will be had by all. Evening Band Labs with The Syncopaths and Uncle Farmer: If you’re not on the dance floor, head to the Band Lab! Uncle Farmer will demo and discuss how to get the most out of the music, even if you’re only two! Watch the Syncopaths in action as they work in real time arranging tunes, navigating possibilities and keeping all members musically satisfied. Demos and discussions. It's All Music All the Time! For those who want to play music all the time, this is the place to feast on workshops all day long, and music jam sessions moderated by staff bands during the evening dances. Keep an eye on this page for more details as the program develops. With such an outstanding musical staff, we'll have lots for everyone. I enjoyed camp and thought the bands were superb. I especially liked campers being able to play with members of the bands regardless of our experience. Dancing with people who are skilled was also a great experience. The standard is so high that improving [camp] would be very difficult.